Esther, like Ruth or Jonah, is a book which records events that really occurred. Like Ruth, it is one of the historical writings, but like Jonah, and even Ruth, it is also a book which prophetically looks forward, while also being given in types and shadows of other things. But Esther doesn’t just look forward, it also looks back on history and, through the real events that it records, it gives us a snapshot of all of redemptive history, but most especially in how it deals with the Jews. To insert the church into Esther would be to mischaracterize the symbolism of what we are being shown. It is true that the church is included in one of the seven dispensations of time, but the church deals with both Jew and Gentile. Rather than focus on the Gentiles during the dispensation of Grace, Esther looks at how Jews, as a people, have responded to that period. There are enemies, and then there are enemies. Can we not say that a state of enmity exists between Christ and the unbelieving Jewish people of today? Of course we can! If we deny this, we are naive in how we view Scripture. And yet, there are those out there who are completely foolhardy in this regard. They claim that the Jews are saved through their adherence to the Law of Moses. This is known as dual-covenant theology. It is heretical and it is dangerous. And more, it is specifically refuted by an understanding of what the Book of Esther is showing us. Paul is very clear when he speaks of the enemies of the cross of Christ, including all – Jew and Gentile – who have rejected His work. Death is an enemy. But death is merely the result of sin. Therefore, sin is an enemy. But sin is the result of disobedience to law. The book of Leviticus, speaking of the law, says that the man who does the things of the law will live. However, nobody but God can do the things of the law. If we could, we wouldn’t need Jesus! Thus, the law – though it is good – actually acts as an enemy to us because of our sin nature. And the law exists. Just as the law in the Garden of Eden was given and it led to the fall, the Law of Moses does the same. The law exists, and there is nothing that we can do about it. We are defeated as foes of the law… but for Christ Jesus. The removal of their enemies. Well said, John Lange. But just who are the enemies being pictured in this book? And who then is the great enemy, Haman, picturing? And even more, the ten sons of Haman were counted as the enemies of the Jews as well. Other than a list of names, we know nothing more about them than that they were his sons, and that there were ten of them. And yet, Esther felt it necessary that they be hung for all to see after they had been killed. And more, the Lord specifically included these details in His word. Why? Who is the great enemy of the Jews today? Esther, even without the answers to these questions, has been a marvelous adventure. But the questions beg for us to answer them, and so we will. I pray that what is presented to you today is wholly in accord with His superior word. And so let’s turn to that precious word once again and… May God speak to us through His word today and may His glorious name ever be praised. The narrative now jumps suddenly from the accounts of what occurred on Purim, and how the celebration was mandated, to a statement concerning the imposition of tribute on the land by King Ahasuerus. It seems entirely out of place stating the words of this verse now. It is as if it is haphazardly tossed in here without any anchoring in the narrative. In fact, Jamieson-Fausset-Brown finds it perplexing enough to state that Chapter 10 is simply an appendix to the history already presented, and that it has been improperly separated from the preceding chapter. But such is not the case. Though connected to what has been presented, it is also a completely different thought that has its own unique purpose and design. The word used, mas, or tribute, is elsewhere consistently translated as “forced labor.” Thus, it is assumed that this forced labor equates to the levying of a tribute upon the lands under the authority of the empire. For the Persian empire, the islands mentioned would be those which are found in the Aegean Sea. The reason for the tribute is unstated, but because it follows directly after the war between the Jews and the nations, it can be assumed that the war was actually so great that the empire required the tribute in order to rebuild, repair, and redirect. Thus a tribute was levied in order to overcome the effects of the war that occurred. 2 (con’t) are they not written in the book of the chronicles of the kings of Media and Persia? The book of the chronicles of the kings is said to not only contain the record of King Ahasuerus, but it also chronicles the deeds of Mordecai, relaying that he also possessed kingly power. Although he is positionally second, he bears the dignity and authority that stems from the kingly throne. It is the logical conclusion to the statement that he is recorded in these writings. *3 (fin) seeking the good of his people and speaking peace to all his countrymen. Secondly, the next acrostic in order says, b’shuvi shlomii, or “In my return is peace.” Considering the surrounding text, it is a rather remarkable acrostic which matches the intent of what is said in the verse itself. In fact, Sergio never read the verses. He just searched for the acrostics and then laid them out. When I told him how precisely they match the surrounding verses which speak of peace to Mordecai’s countrymen, he was astonished. Finally, many of the acrostic words in this verse form the same concept backward and forward. A theme is repeating as a stress to the story itself. Now, with all of the book analyzed, the obvious question is, “Is there anything beyond the surface story that the Lord is telling us?” Esther is the last book of the Old Testament historical writings. Therefore, it would makes sense that what is recorded here would parallel the final historical account of Scripture itself. It is with that thought in mind, that we will all-too-briefly review the book of Esther from a pictorial perspective of history itself. Exalted to the right hand of God! Read Galatians 4:21-31. In Galatians 4, Paul says the two wives of Abraham are symbolic of the two covenants. Esther follows this same remarkable symbolism, showing it from another angle. The book of Esther began with a statement concerning the reign of Ahasuerus over the entire realm of the empire. It then ended with a statement concerning the king imposing tribute on all the land and islands of the sea. But it includes the addition of the greatness of Mordecai. During the story, however, there was a time when the enemy of the Jews held that same position. From this, we can then see a history of the world itself; the dispensations of time in which the Bible is divided, and which detail the plan of redemption, brought about through a particular group of people, and a particular Individual, chosen to deliver them and be exalted among them. And this is how Shushan is described right in Chapter 1. The details of the palace were magnificent. It was a place of joy and feasting, beauty and royal splendor. There was harmony, just as in the Garden of Eden. It is the dispensation of (1) Innocence. But then there arose a problem. The king sent his seven servants to bring his bride before the people. She disobeyed his orders. It is a picture of the fall of man. Vashti pictures the state of disobedience leading to the fall. If you remember, it was conjectured, rightly, that the king had asked Vashti to come with her crown, but nothing else was mentioned. Thus she was naked; a picture of a sinless state. However, she hid herself from the king. It is reminiscent of Adam and his wife hiding in the garden from the Lord. Man was made lower than the angels, and he was crowned with glory and honor, but that crown was removed, and he was expelled from the presence of the Lord. Thus we see that Ahasuerus pictures the divine throne of God in Shusan, Paradise. Vashti signifies disobedience, and a loss of access to that throne. It was not merely an offense against the king, but against the throne. The same is true with the fall of man. It was an offense against the ruling power of God. It thus resulted in the fall of man and his expulsion from the Lord’s presence. At the fall, man was given authority over the woman in Genesis 3:16. This is repeated in Esther 1:22, where it said “that each man should be master in his own house.” It is the dispensation of (2) Conscience. After this came a new law to correct the situation which occurred with Vashti. A search would be made for a new queen to replace her. This is the dispensation of (3) Government. It is a time when man would be found in many people groups, but in which a select line would be chosen out of them for the king’s delight. Each people group is represented by the gathering of the virgins, but only one will be selected. It is thus an anticipation of the dispensation of Promise, and which is realized in the selection of Esther. Hegai represents the Spirit of the Lord, directing the events, choosing the right person for the Promise, and relaying what is pleasing to God. Esther was chosen by him, he tended to her until she was ready for her meeting, and he recommended what she should take before the king. However, she was given the choice. She could have taken whatever she desired, but her desire was to take what Hegai knew would please the king. It is a picture of free will being exercised in accord with God’s will, and thus it is a picture of salvation by grace through faith. The grace was given to Esther through her unmerited selection. The faith was Esther’s willingness to trust not in her own self, but in Hegai’s words. And this led to her selection as queen. It is the call of Abraham; the dispensation of (4) Promise. Thus, whereas Vashti signifies disobedience and a loss of access to the throne, Esther signifies faithful obedience and access to the throne. Said otherwise, she represents the beauty of the Gospel. Hence, emunah in Hebrew, or pistis in Greek – both meaning “Faith” – are feminine nouns, represented by Esther. Death comes through the law. Instead of accepting Haman’s silver, the king said to him, “The money (keseph/silver) and the people are given to you, do with them as seems good to you.” In the Bible, silver pictures redemption. Through the law would come redemption, but not in the way expected! The approval of the law was filled with seemingly surplus words – destroy, kill, annihilate; and young and old, little children, and women. The cruel passion of the overuse of words was to ensure that complete destruction of all Jews, without exception, is the ultimate goal and expectation. Law leads to death for all. The people of Israel were given the law, and the law set about to bring death – exactly as the account in Esther shows, and exactly as Paul explains it in Romans. It appears that Haman, Law, would prevail. But it must be remembered that justification by grace through faith – the Gospel – came before the law, just as Esther was introduced before Haman. The importance of this will be explained later. With the coming of Haman, pur, or lots, were cast, and a date for the destruction of the Jews was set. The law was written, and it could not be revoked (or pass away). Though it seemed out of control, the unseen Lord’s guiding hand was still evident in Esther just as it has been evident in history. The law was not a mistake, but a lesson, a guide, and a tutor. We must remember that access to the throne was already granted to Esther, but it was not through law; it was by grace through faith. The law also provides access to the throne, but in a completely different way – total obedience; something we are incapable of. What this means for now though is that Law, represented by Haman, is actually the enemy of the Jews. The very thing they trust in, is the very thing that is set to bring about their destruction. Ask any observant Jew if they believe this, and you will be called a lot more than just a heretic. And yet, this is what the Bible teaches, most specifically in the New Testament. However, it is even seen interspersed throughout the Old Testament as well. From Abraham, to David, to Isaiah, to Habakkuk, it is the constant, and yet wholly ignored, theme presented to Israel. While considering the story thus far, what has been the status of Mordecai? Oh yes, Mordecai! We have overlooked that guy. His status? He has remained relatively out of the picture. He is in Shushan, or Lily. He raised Esther as his own daughter. Remember that she pictures restored access to the throne by grace through faith; the beauty of the Gospel. He also sat within the king’s gate, and he charged Esther to not reveal her family or her people. That itself represents God’s dispensational plan of redemption. Though the pattern is set in Abraham, the dispensation of Promise, that stays concealed so that the dispensation of Law may be worked through. It is, as Paul relays in Galatians, a necessary step intended to lead man to Grace. If Law prevails, the people would continue to die because by the law is the knowledge of sin, and the wages of sin is death. Thus the devil would retain his authority over the world. Christ knew this, and so He came not to destroy the law, but to fulfill it. In His fulfillment of it, the law would be rendered powerless. This is why Christ didn’t dispute the devil’s claim that the whole world was his and he could give it to any he chose. Through Law over fallen man, this was a true statement. In destroying the Jews, the promise of God to the patriarchs would fail. Here we can remember what was said in Chapter 3 concerning the date of the casting of lots by Haman, the 13th of Nisan, the day before Passover. It was at this same time, almost 500 years later, that the Jews who prided themselves in the law, conspired together to destroy, Christ Jesus. As we saw, the number thirteen is the number connected to rebellion, apostasy, defection, corruption, disintegration, revolution, or some kindred idea. The law is an entity, not a person. But that entity is contrary to what has already been established in another entity, the Gospel of grace through faith, already seen in Abraham, and pictured by Esther. It is an apt enough description for us of Mordecai at this point. Right at the beginning of Chapter 4, we read that “When Mordecai learned all that had happened, he tore his clothes and put on sackcloth and ashes, and went out into the midst of the city. He cried out with a loud and bitter cry.” At that time, we were shown a very specific parallel between Mordecai and Esau. In the Genesis sermons, Esau pictured fallen Adam. Jesus took on the nature of man, his humanity. In 1 Corinthians 15, Paul calls Him the second Adam. This then is the time of Jesus’ incarnation. He thus is representative of Israel, having lost their blessing, and who is now facing a curse. Christ came from Israel, revealing His humanity and that He is a Jew, under Law. From there, Esther (the Gospel) wants to know what is the distress concerning Mordecai (Christ). So she sent Hathach to find out what was troubling him. Mordecai in turn explains what has transpired, including the decree of Haman, meaning death through the law. He notes the parashah, or exact amount of money that was offered for the destruction of the Jews. Up until that point, everything was singular. All of a sudden, in verse 12, it changed to the plural. The plural, “they,” is speaking of anyone who had thus far believed God’s promises of faith in the Messiah. Messiah had been promised, and there is now a questioning of the Gospel of Grace by Faith. Had it failed? Would Law prevail? But rather than being an inopportune time, it was the perfect time – thirty days. The number thirty signifies “a higher degree the perfection of Divine order, as marking the right moment” (EW Bullinger). The chain of events had reached a time where a new direction should be sought. And so Mordecai, picturing Christ, instructs that it is the perfect time to rely on the Gospel, and not be destroyed by Law. A marvelous change could be expected. It is at this time that Esther approaches the king without being summoned. Would she receive grace? The words testify to the fact – naseah khen b’enav, “she obtained grace in his eyes.” Yes! “The just shall live by faith.” And this was while Law was still the law. In this, the offer of the king is made, “What do you wish, Queen Esther? What is your request? It shall be given to you—up to half the kingdom!” Her only request, a banquet with the king (the throne) and Haman (Law). And that led to the petition for another banquet on the following day. But on that same day, the plot to hang Mordecai was also made. Haman’s hatred of Mordecai is seen in the Jews of Jesus’ time concerning Christ Himself. They wanted Him destroyed and so they plotted against Him. They trusted their deeds under the law rather than what the law pointed to – Christ. This is what Paul wrote about in Romans 2. A person “is not a Jew who is one outwardly, nor is circumcision that which is outward in the flesh; 29 but he is a Jew who is one inwardly; and circumcision is that of the heart, in the Spirit, not in the letter; whose praise is not from men but from God.” The Gospel of grace through faith in Messiah was concealed in the Old Testament, just as Mordecai instructed Esther to conceal her identity. Now that time was ended. And so, on the same night, the king’s attention is directed to one whom he has decided to now honor. The time for the long overdue acknowledgment of approval has arrived. Calling in Haman (Law), he asks “What shall be done for the man whom the king delights to honor?” Obviously, those under law feel they have earned the right to the king’s favor, and so Haman thinks up the most outlandish and ostentatious display he can think of to herald his victory. But then… it is Christ who is to be honored, not Law! And so what happens… it is he, Law, who lays the kingly attire on Mordecai (Christ), just as the kingly attire was placed on Christ in the gospels. Law actually adorns Christ for who He is! Haman then leads Mordecai on a horse shouting aloud “Thus shall it be done to the man to whom the king delights to honor!” Paul says specifically that “the law was our tutor to bring us to Christ, that we might be justified by faith.” In picture, Haman, leading Mordecai around on the horse and yelling out his proclamation, is doing exactly that. Law is acting as a schoolmaster to the people that the king delights to honor grace through faith in Christ, not Law, because Christ is the fulfillment of the Law and the end of the law for righteousness for all who believe. It is by faith in Him, not in our deeds, that God delights. And to make that point perfectly obvious, Haman is then horrified, covering his face and rushing home where his wife and friends tell him that “If Mordecai, before whom you have begun to fall, is of Jewish descent, you will not prevail against him but will surely fall before him.” Messiah has come. The Savior of Israel has made Himself manifest. The dispensation of Law is near its end. Chapter 7 opens with the second banquet of Esther. It is when she petitions for her people, the Jews. They are under Law, and they are destined for annihilation. When the king finds that it is Haman (Law) that has set them for destruction, His wrath was raised. It is a picture of the wrath of God at sin. Paul says in Romans 4:15 that “the law brings about wrath,” and so there is only one way to remove the wrath, and that is through the death of Law. But the law is written, and it cannot pass away. However, its effects can. Again, Christ said, “Do not think that I came to destroy the Law or the Prophets. I did not come to destroy but to fulfill” (Matthew 5:17). Haman pictures Law, but Christ actually died. It was Christ who was nailed to the cross, and so in type and picture, Christ became our Haman, our Man under Law, if you will. It is no different at all than Christ equating Himself with the serpent on the pole in John 3:14, or Paul saying that God made Him who knew no sin to be sin for us. In the death of His body, the law died with Him for all who believe. For all who don’t, Law, and thus the enmity, remains. Many fanciful explanations have been made up about this, but the truth is revealed in what happened to Haman, when he was taken to be executed… they covered his face. The Law was to die. Christ died in fulfillment of the law. When He arose, the face covering was removed, and carefully folded. It was an intentional act of the Lord showing that the shame of death through Law had been removed for those who trust in Him. The Jews cling to the law, but it is Christ who has defeated that enemy. The law is annulled in Christ. This is the message of Purim. At the opening of Chapter 8, the first verse says, “On that day King Ahasuerus gave Queen Esther the house of Haman, the enemy of the Jews.” The Gospel has prevailed and has received everything that Law possessed. This is certain because no definite article was placed in front of the word “house.” Instead, it said, beit haman, or “house of Haman.” It is comparable to speaking of the house of David, meaning not just a physical house, but everything associated with David. What belonged to Haman (Law), all which made him who he was, transferred to Esther (Gospel). Paul refers to the promise of Abraham as a “covenant.” He then says that the law cannot make it void. Likewise, the new covenant in Christ does not void the old covenant through Moses, but our death in Christ gives us a new life. In this, we are dead to Law and freed from it, and yet we are alive in the new covenant of Grace. Believe it or not, this is all seen right here in Esther. No law of God can be revoked, it must stand, including the Law of Moses, but He declares through the Gospel that the law is no longer in effect for all who are in Christ. However, the law still has power over all who do not believe. The Jews are not out of hot water yet. They are sold to destruction by Law, even if Law is defeated. The date of their destruction is set, and it cannot be revoked. But Esther (Gospel) petitions the king for her people. There must be a way to save them. And so the King instructs Esther and Mordecai to use their signet authority. This is the reason for including the tribe from which Mordecai was from, Benjamin. It pictures what occurred. Benjamin was first named Ben-Oni, and then Benjamin. The Son of Suffering had become the Son of the Right hand. The signet of authority is His. And so He will use that authority in a remarkable way. As I noted in Chapter 8, the word, tabaath, or signet was first used in Genesis 41:42 concerning the signet ring of Pharaoh. That was taken from his hand and granted to Joseph. It pictured the authority of Christ. After that, the same word was used to describe the rings for carrying the Ark of the Testimony in Exodus 25, which pictured the four gospels that reveal Christ. They are the link between the Old and New Testaments which speak of the coming Christ and the Christ who has come. They reveal His authority. The power and authority is found in the tabaath, or ring. Something Mordecai, picturing Christ, then uses. The word issued by Haman (Law) is irrevocable. In this case it is a word which brings death. And yet, another word can be issued which will grant life. The king would not allow one word of reversal of the former command, but yet its power could be annulled through a new command. The signet is the granting of all power and authority to Christ. The law is set, but He can still act without revoking the law. Though it is the dispensation of Grace, the focus is solely on the Jews, and Chapter 8 goes directly from the time of Christ’s first advent, to the tribulation period. The whole world, pictured by the Persian Empire, is set to destroy the Jews, but the Jews are now granted authority to defend themselves. It is a physical battle in Esther, but it as much pictures a spiritual one. The edict is issued is from Mordecai (Christ), and Esther (the Gospel), it is the New Covenant. At the end of Chapter 8, Mordecai went out in royal apparel of blue and white, with a great crown of gold and a garment of fine linen and purple. The colors are reminiscent of those used in the tabernacle. They signify the exaltation of Christ, the embodiment of the law, His righteousness, His deity, His purity, and His royalty granted because of His sacrifice. The Jews of today are at enmity with Christ. They are under Law, and the time of their destruction has been decided. But in the Bible, the final books after Paul’s letters are directed to them, not to the Gentiles. Hebrews, James, and Peter specifically, and John and Jude to some extent. And then there is Revelation. Chapters 1-3 are written to the church, but verses 4:2-19:10 are written to the Jews of the end times. The physical destruction which is coming against Israel is a given, but the spiritual revitalization of them in coming to Christ is also. The Jews will prevail over their enemies, but the highlight of the narrative focuses on a very particular group within Sushan – five hundred the first day, three hundred the second day, and the ten sons of Haman. The larger numbers were explained in Chapter 9, but what was the point of mentioning the death of the ten sons of Haman, and then their being hanged after they were dead? The answer is exactly the same of that of hanging Haman. The ten sons of Haman are what issue from the giving of the law, the Ten Commandments. It is Esther, the Gospel, who says to hang the ten sons of Haman. It is the Gospel of Christ which demands our allegiance to Him as the fulfillment of the law, not to the law itself. Hanging Haman left the sons untouched for the Jews. While the church pursued Christ, the Jews pursued Law. Despite issuing from the law, the Ten Commandments are the basis of it. As long as Law is the goal, and not Christ’s fulfillment of it, a spiritual battle will always exist. Israel today, whether observant or secular, finds its foundation in the law, summed up by the Ten Commandments. Until they find their true foundation in Christ, the fulfillment of this law, they will remain at enmity with God. The Ten Commandments sum up the Law; Christ embodies the law. It is Christ who died on the cross, and yet Paul said that it is the law, meaning Christ’s fulfillment of it, which is nailed to the cross. People try so hard to find a distinction between a moral law and a civil law in the Law of Moses. The Bible never makes this distinction. One is either under law and under sentence, or they are in Christ, under grace, and free from condemnation. Those are the only two choices the Bible gives. Chapter 9, symbolizing the Tribulation period, is given to lead the Jews to this understanding. Until they come to that realization, tough times lay ahead for them. But that time will end. The new law which is written is that which was prophesied in Jeremiah 31. A New Covenant was promised to the house of Israel and the house of Judah, but it only comes into effect for them when they, as a national group, accept it. The one hundred and twenty-seven provinces picture the world. The New Testament epistles have gone out to the entire world, and they almost always begin with the word “peace,” and they always speak of Christ, who is the Truth. It is that word in Hebrew, emeth, or Truth, that we carefully analyzed in the last sermon. It is used 127 times in Scripture, just as there are 127 provinces. The Truth of Christ has gone out to the whole world – He is God; He did go to the cross, and He did shed His blood; He was, He is, He will be. All of this leads to what lies ahead for the Jews as a people, the (7) Millennial Reign of Christ, Chapter 10 of Esther. King Ahasuerus pictures God, the ruler of the world, the greatness of Mordecai is the greatness of Christ Jesus, the second Member of the Godhead. It is the greatness of Mordecai which is highlighted in verse 2. He was advanced to his position of authority which was then recorded in the book of the chronicles of the kings of Media and Persia. There in verse 10:2 is the second and last us of the word parashah in the Bible. 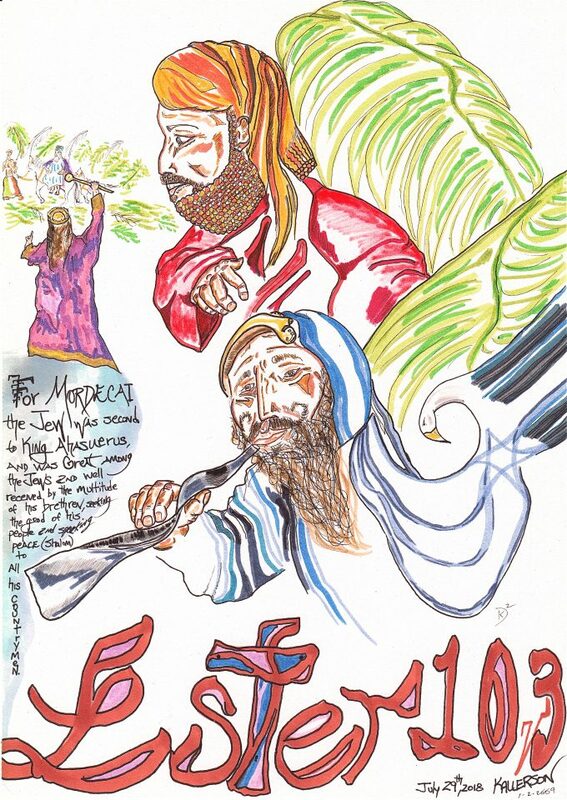 Someday, the Jews will no longer look to the Law for their readings, but to – as it says – the “account of the greatness of Mordecai,” meaning the glory of Christ. As I noted, it is the first time they are called “Media and Persia” rather than “Persia and Media.” And that is in conjunction with the words, “the book of the chronicles of the kings of Media and Persia.” As we saw, Media is associated with the word madad, or measure. Persia signifies “Division(s).” Where there were divisions and then the measure, there is now the measure and then divisions. There is a harmony which has been realized which was previously lacking. Thus the name is stated this way to show this. It is a picture of the Bible, God’s measure (canon), followed by its divisions – Testaments, books, chapters, and verses. Imagine that! “…the divine establishment of the people in the land in subjection to Jehovah.” That is exactly what has been anticipated since their inception as a people. They have cast off His rule since the beginning, but the time is coming when they, the Jews, will be subject to Him, because of Christ. What is even more unusual is that the myrtle is never mentioned until the first captivity of the Jews, but then it is specifically said to be used in the building of the tabernacles in Nehemiah 8:15, even though this was not stated in Leviticus at the giving of the law. Thus, the myrtle is again seen to be a picture of restoration. Understanding this, it is to be noted that the only Feast of the Lord mandated for the time of the Millennium is the Feast of Tabernacles. It makes it all the more amazing that the myrtle is here mentioned in this acrostic. Finally, the acrostic finishes with, “and the Word is here.” The Word of God (Christ) will be there, ruling among His people, symbolized by Mordecai who bears the authority of the king. And then that is topped off with the final acrostics of verse 3. The secret question is, “How many of them?” The answer is “Completely.” This is referring to all who enter the Millennium. All of them will be believers in Christ. This is what is pictured in this final passage of Esther. It is an amazing journey that Israel has been on, and it will soon come to its fulfillment. The Lord has regathered this particular group of people back into their land, and there they shall face their enemies, both physical and spiritual. When they realize what they have missed for so long, they will openly mourn over the path they had chosen. But when the time of mourning is past, they will rejoice in their deliverance, and they will celebrate in a way that they have never celebrated before. This is the story of man’s redemption, from tragic fall to final restoration, it is all about the One who came to make things right again. Esther is a snapshot of this from a time gone by, and yet looking forward to a time of glory which lies ahead. How great is this word which reveals such marvelous things! Of the kings of Media and Persia? Don’t they speak of this thing? Hallelujah for Esther, a marvelous part of Your superior word! thanks Charlie for such an informative sermon. It does dovetail with dispensationalism, which I was taught in Bible school. I had never heard of john Peter Lange and his commentary. wow, I enjoyed watching the sermon, (thanks for stressing to us the need to watch it to understand the plight of the jews), and now I have followed up by taking a look at your written sermon the past 3 days. John, thank you SO MUCH for your overly kind comments. Your words are very, very much appreciated. God bless you and keep you!